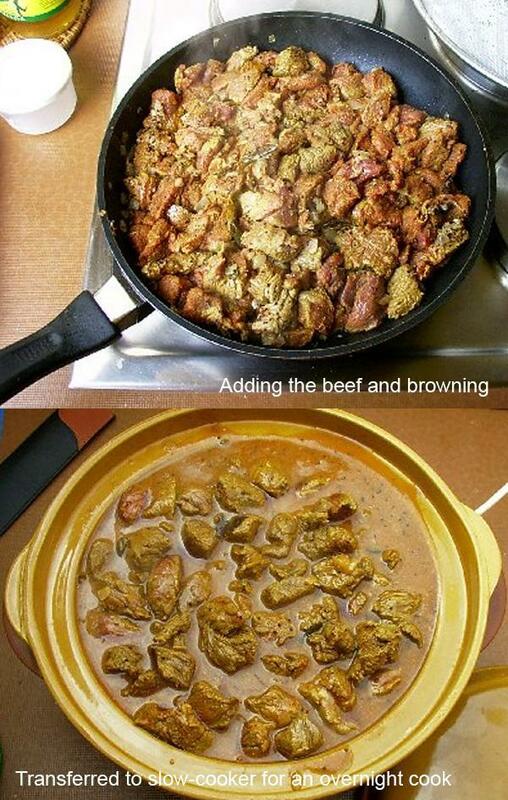 This recipe should now be called 'Chennai Beef Curry', as Madras has now been renamed as Chennai! 1 kg. good quality lean steak. 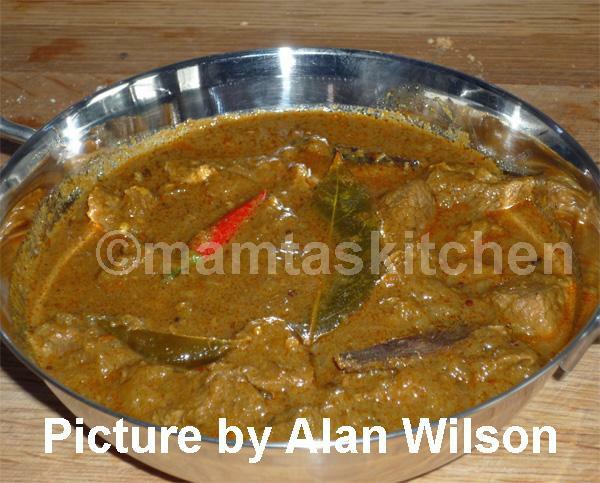 Curries cooked from poor quality meat do not taste good, unless slow cooked like a casserole or pressure cooked. 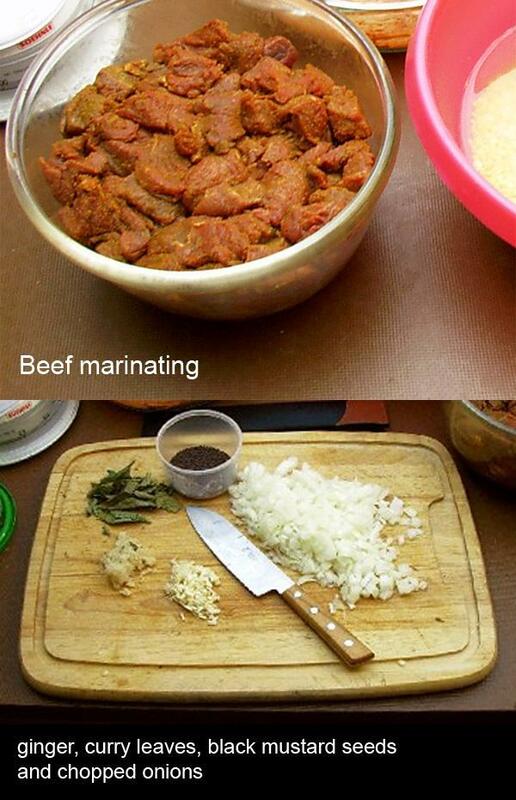 Place meat in a bowl. Add coriander, cumin, salt, turmeric, chilli powder and vinegar and mix well. Keep aside to marinate while preparing onion, ginger, garlic. Add mustard seeds. 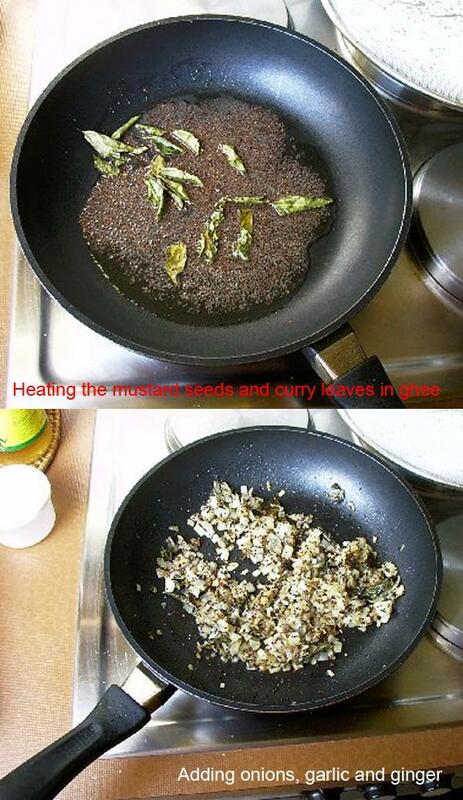 As the seeds start to splutter, add curry leaves, stir quickly and add onions, garlic and ginger. Fry until onions are golden-dark brown. Add meat and spice mix and stir fry until meat is well browned. Add tomato purée and stock/water. You can transfer it to a slow cooker at this stage and leave it to cook according to your slow cooker instructions. I would cook it on medium heat for 6-8 hours, until meat is tender (my cooker has the settings slow for keeping warm, medium for prolonged cooking and >high for faster, initial cooking). For cooking in a pan, bring to boil, cover and simmer on low heat for 1 hour, or until beef is tender. For cooking in a pressure cooker, cook under full pressure for 6-7 minutes. The time required to cook depends on the quality of meat and the method you use. Cheap cut meats are best cooked slowly over a period of several hours. The better the meat, faster it cooks. When ready, the gravy should coat the meat nicely and not be too runny. If it is runny, boil it briskly for a few minutes. Turn heat off, add 2/3rd of coriander leaves and stir. Garnish with remaining coriander leaves and serve hot with Boiled Rice. You can use tamarind paste, instead of vinegar and tomato purée. Once cooked, you can add a tin of coconut milk, to give it a different flavour.